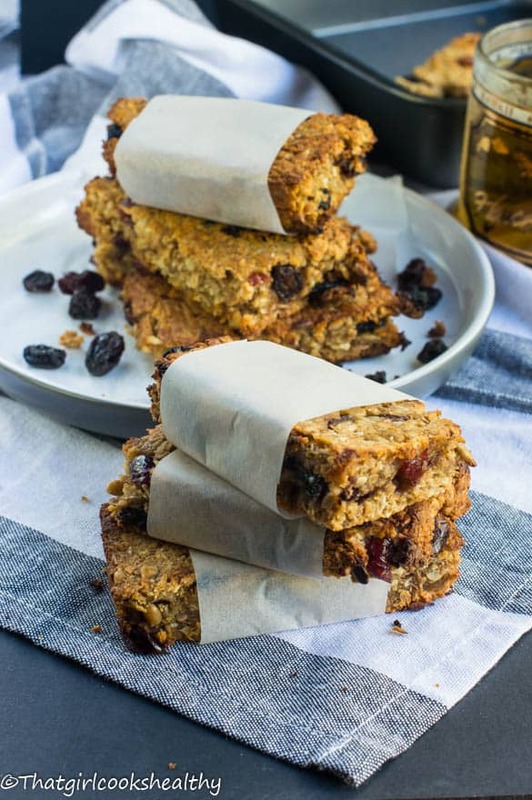 Gluten free granola bars – Learn to make the best nut free breakfast bars on the plant. A great chewy nutritional source to eat on the go. 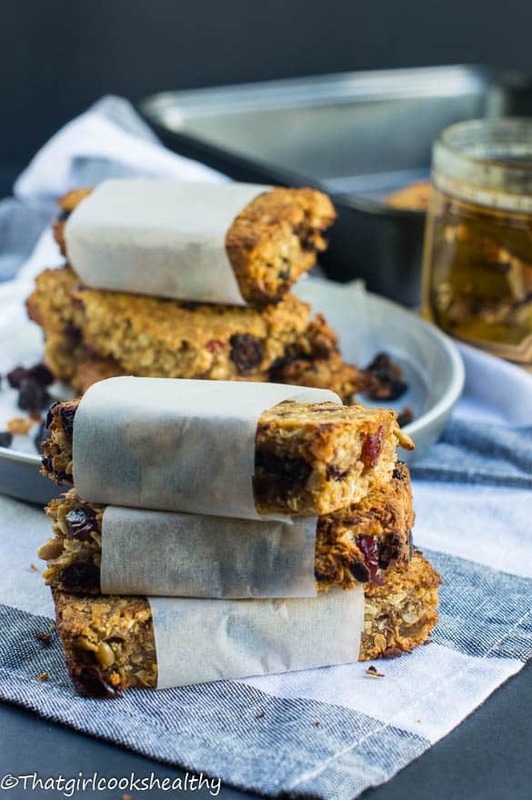 In short granola bars are little baked bars that are consumed for breakfast. 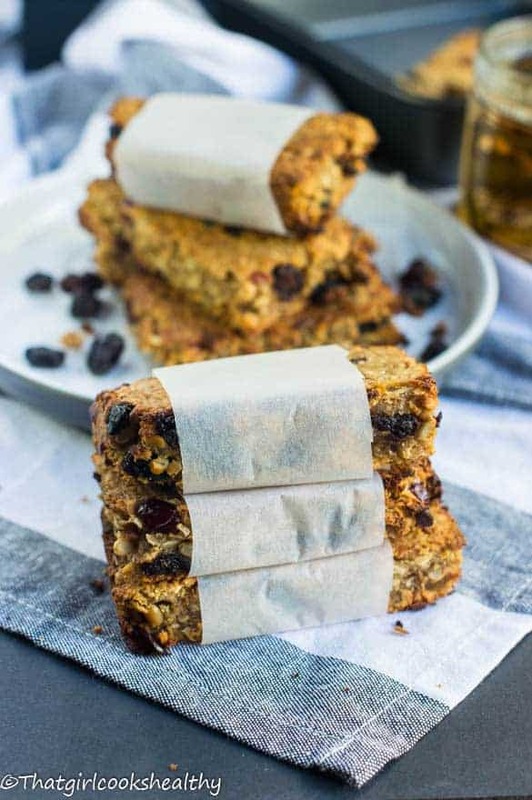 These bars consist of oats, honey, nuts, seeds, dried fruit and combined together with sweetener such as honey, sugar or some type of syrup. 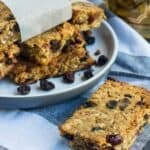 Granola bars – love them or hate them, they are here to stay! 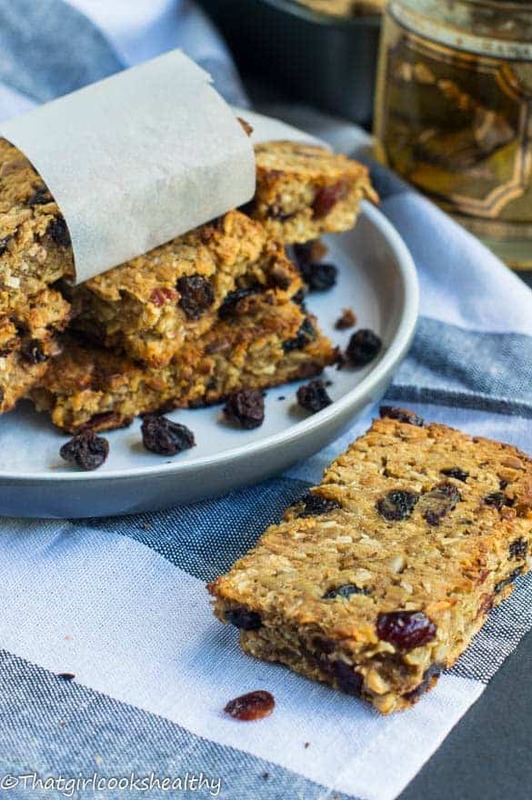 Granola bars are extremely popular right now, you’ll find them everywhere; supermarkets, farmers markets, health stores etc.. you name it and it’s there. I tell you what, just mention granola bars be it nut free or not during your next conversation about food and I promise you that whoever you’re conversing with will engage in some discourse about granola – you either love it or hate it. Good question! The thing which concerns me the most about these bars are those unwanted preservatives and high levels of sucrose (sugar). While I love eating granola bars, the sugar content is often off putting. High levels of sugar consumption especially refined white sugar or processed syrup can contribute to obesity, high low pressure and non alcoholic fatty liver disease. 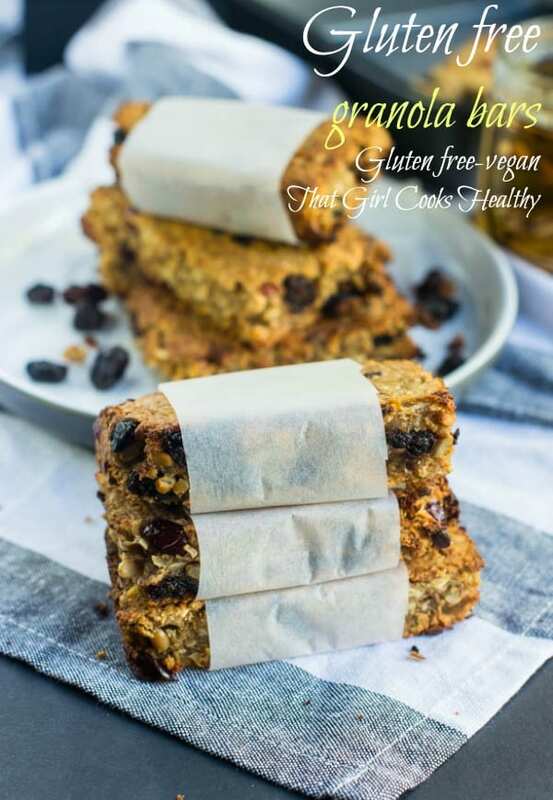 Eating the type of sugar i.e low GI index or fruit (frutose) in moderate is the key to a healthy balance of exposing yourself to sugars without compromising ones health, which is what this gluten free granola bar recipe is all about. To remedy this sugar fad problem I went ahead with making a batch granola bars myself, with that being said, mine are slightly moist because I sweetened them with applesauce and a very small amount of coconut nectar (low glycemic index). The applesauce creates a moisture and chewy texture without going overboard with the sweetness. The low sugar content makes them perfect for people who are afflicted with diabetes, hypertension or providing your little ones with a healthy sweet treat. They’re loaded with cranberries, raisins, seeds, coconut and a few spices to enhance the taste. I also used gluten free quick oats, that tend to absorb more moisture than jumbo oats, so you;ll find the texture to be chewy, if you want more of a crunch, no worries, simply use gluten free jumbo oats. Oats are naturally gluten free but because of cross contamination always purchase “gluten free” oats. Preheat the oven at gas mark 4 or 190 degrees celsius. Line a baking sheet with parchment paper and toast the coconut and oats for 10 minutes. Don’t worry if the entire batch doesn’t turn brown. Meanwhile get the binding ingredients ready and combine the applesauce and coconut nectar together in a large mixing bowl. Proceed to remove the toasted grains from the oven and cool for 5-10 minutes. Fold in the oats, sunflower seeds, fruit, spices and vanilla into the wet ingredients until the oats are well coated. Tip the granola mixture into a square baking tin lined with parchment paper. Add another layer of parchment paper on top and proceed to press down lightly using a baking tin of the same size to press down with. Remove the top layer of parchment paper prior to placing in the oven. Bake in the oven at gas 4 or 190 degrees celsius, baking time will vary depending on the size of the oats. Jumbo oats should take 15-20 minutes. Quick oats due to the excess moisture will take 30 minutes. Check throughout in order to ensure the granola doesn’t burn. Recipe sounds delicious. Love cranberries. Interesting vanilla powder addition. I have never used it. What’s your experience with it? Gemma, it’s virtually the same only I use vanilla powder to keep the recipe alcohol free and as natural as possible. Oh wow! what a fun weekend , always great to happy family over . I totally agree with you about having the younger ones help out in the kitchen. Makes cooking so much approachable for them when they get older. I could use those bars right now. They really look delicious!!! Thanks Imma, I felt left when I’d read your recipe with your little boy involved, so while I was babysitting I thought I’d use it to my advantage to draft my little cousin in the kitchen, it certainly paid off. Can you substitute coconut nectar for something else? Hi Morgan, any low GI index sweetener such as maple syrup, agave nectar will suffice. Hi! 180 degrees what? F or C? It’s a drupe, not a true nut. Can you leave out the coconut? Should I replace it with something else? I have family with nut and coconut allergies. Hi Tabitha, Yes you can omit the coconut if allergies are a problem. I would suggest replacing the coconut with ground flaxseeds to bulk up the recipe.